The Liverpool Playhouse Theatre has been at the forefront of British theatre plays from their inception and are both inextricably linked to the history of the Liverpool. Since 2000 It has have been run under one management system. Who are a registered charity supported through Public Funding from the Arts Council England and Liverpool City Council. Since 2003, under the leadership of Gemma Bodinetz (Artistic Director) and Deborah Aydon (Executive Director), the company has been totally transformed artistically and physically to become the celebrated E&P Liverpool theatrical force it is today. 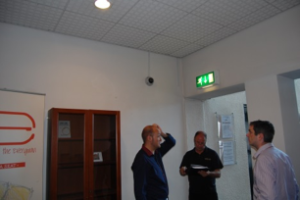 They have installed over 70 QVIS Cameras with two Qvis T4 Cortex NVR Systems under the watchful eye of Mark the IT Theatre manager. Which was well supported by everyone involved, including The ADATA Key Account Manager; Brian Milnes. Steve Maitland and his son Sam, under the guidance of Bryn Hawkins from Millgate Computers, Closed Circuit Security Ltd, virtually lived in the theatre spending many hours pulling in cables and hiding them ensuring they did not spoil the caricature of the Listed building. We now have a state-of–Art user friendly CCTV system to help protect the staff and customers alike.